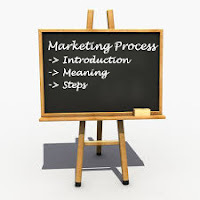 After reading this you will understand - what is marketing process, and the steps involved in marketing process. The Marketing Process of a company typically involves identifying the viable and potential marketing opportunities in the environment, developing strategies to effective utilise the opportunities, evolving suitable marketing strategies, and supervising the implementation of these marketing efforts. Marketing process involves ways that value can be created for the customers to satisfy their needs. Marketing process is a continual series of actions and reactions between the customers and the organisations which are making attempt to create value for and satisfy needs of customers. In marketing process the situation is analysed to identify opportunities, the strategy is formulated for a value proposition, tactical decisions are taken, plan is implemented, and results are monitored. Analysis of situation in which the organisation finds itself serves as the basis for identifying opportunities to satisfy unfulfilled customer needs. Situational and environmental analysis is done to identify the marketing opportunities, to understand firms own capabilities, and to understand the environment in which the firm is operating.